WASHINGTON (AP) — The Obama administration faced a breakdown in confidence Sunday from key foreign allies who threatened investigations and sanctions against the U.S. over secret surveillance programs that reportedly installed covert listening devices in European Union offices. Several European officials — including in Germany, Italy, France, Luxembourg and the EU government itself — said the new revelations could scuttle ongoing negotiations on a trans-Atlantic trade treaty that, ultimately, seeks to create jobs and boost commerce by billions annually in what would be the world's largest free trade area. European Parliament President Martin Schulz said he was "deeply worried and shocked about the allegations of U.S. authorities spying on EU offices." And Luxembourg Foreign Minister and Deputy Prime Minister Jean Asselborn said he had no reason to doubt the Der Spiegel report and rejected the notion that security concerns trump the broad U.S. surveillance authorities. "We have to re-establish immediately confidence on the highest level of the European Union and the United States," Asselborn told The Associated Press. Britain's The Guardian newspaper also published an article Sunday alleging NSA surveillance of the EU offices, citing classified documents provided by Snowden. The Guardian said one document lists 38 NSA "targets," including embassies and missions of U.S. allies like France, Italy, Greece, Japan, Mexico, South Korea, India and Turkey. Speaking on CBS' "Face the Nation," former NSA and CIA Director Michael Hayden downplayed the European outrage over the programs, saying they "should look first and find out what their own governments are doing." But Hayden said the Obama administration should try to head off public criticism by being more open about the top-secret programs so "people know exactly what it is we are doing in this balance between privacy and security." Hayden also defended a secretive U.S. court that weighs whether to allow the government to seize Internet and phone records from private companies. The Foreign Intelligence Surveillance Court is made up of federal judges but does not consider objections from defense attorneys in considering the government's request for records. Critics have derided the court as a rubber-stamp approval for the government, sparking an unusual response last week in The Washington Post by its former chief judge. In a statement to the newspaper, U.S. District Judge Colleen Kollar-Kotelly refuted a draft NSA inspector general's report that suggested the court collaborated with the executive branch instead of maintaining judicial independence. Kollar-Kotelly was the court's chief judge from 2002 to 2006, when some of the surveillance programs were under way. Some European counties have much stronger privacy laws than does the U.S. In Germany, where criticism of the NSA's surveillance programs has been particularly vocal, Justice Minister Sabine Leutheusser-Schnarrenberger likened the spying outlined in the Der Spiegel report to "methods used by enemies during the Cold War." 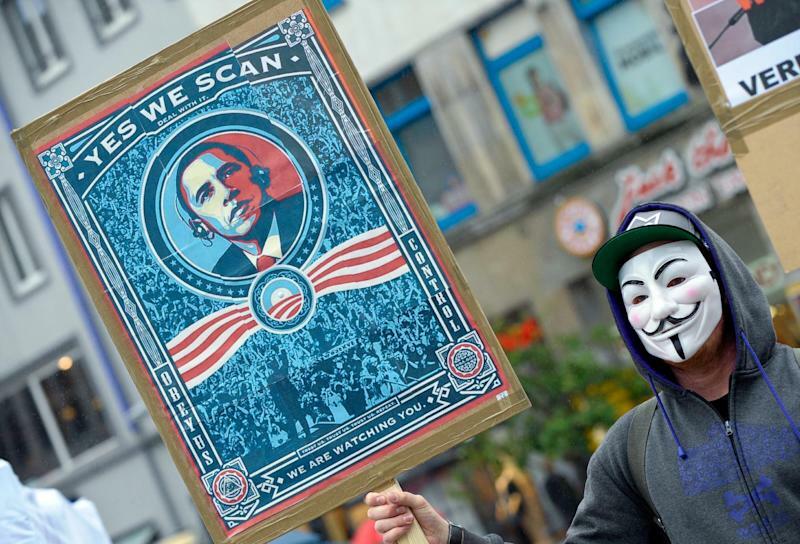 German federal prosecutors are examining whether the reported U.S. electronic surveillance programs broke German laws. Green Party leaders in the European Parliament called for an immediate investigation into the claims and called for existing U.S.-EU agreements on the exchange of bank transfer and passenger record information to be canceled. Both programs have been labeled as unwarranted infringements of citizens' privacy by left-wing and libertarian lawmakers in Europe. Snowden, who tuned 30 last week, revealed himself as the document leaker in June interviews in Hong Kong, but fled to Russia before China's government could turn him over to U.S. officials. Snowden is now believed to be holed up in a transit zone in Moscow's international airport, where Russian officials say they have no authority to catch him since he technically has not crossed immigration borders. It's also believed Snowden is seeking political asylum from Ecuador. But Ecuadorean President Rafael Correa signaled in an AP interview Sunday that it's unlikely Snowden will end up there. Correa portrayed Russia as entirely the masters of Snowden's fate, and the Kremlin said it will take public opinion and the views of human rights activists into account when considering his case. That could lay the groundwork for Snowden to seek asylum in Russia. Outgoing National Security Adviser Tom Donilon said U.S. and Russian law enforcement officials are discussing how to deal with Snowden, who is wanted on espionage charges. "The sooner that this can be resolved, the better," Donilon said in an interview on CNN. House Democratic Leader Nancy Pelosi has a different take on what to do with Snowden. "I think it's pretty good that he's stuck in the Moscow airport," Pelosi, D-Calif., said on NBC's "Meet the Press." ''That's ok with me. He can stay there, that's fine." Jordans reported from Berlin. Associated Press writers Raf Casert in Brussels, Greg Keller in Paris, Frances D'Emilio in Rome, Jovana Gec in Zagreb, Croatia, Lynn Berry in Moscow and Michael Weissenstein in Portoviejo, Ecuador, contributed to this report.